The Oxbow Mine is a surface lignite coal mine just west of the town of Coushatta, Louisiana. The Oxbow mine yields approximately 550,000 tons of lignite coal each year, and along with the neighboring Dolet Hills mine, has been the sole provider of fuel for the 650 mega-watt Dolet Hills Power Station since 1985. 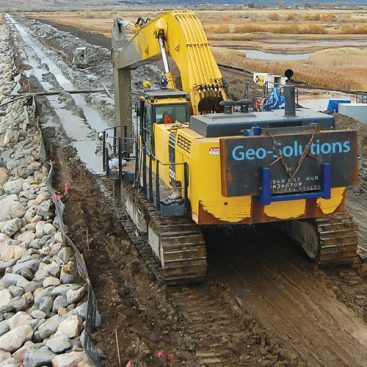 Geo-Solutions was subcontracted to install the Cell #7 Slurry Wall to provide subsurface groundwater control and facilitate surface mining in Cell #7 of the Oxbow Mine. The Cell #7 slurry wall included the installation of a 3 foot wide by 788,804 vertical square feet (vsf) soil-bentonite (SB) slurry wall. The wall was installed to a maximum depth of 76 feet below ground surface (fbgs), keying a minimum of 10-feet into the local Wilcox Group soil formation or 5-feet from design depth. Excavation was accomplished under bentonite slurry using two Komatsu PC1250 excavators and GSI’s long-reach booms and sticks attachment. 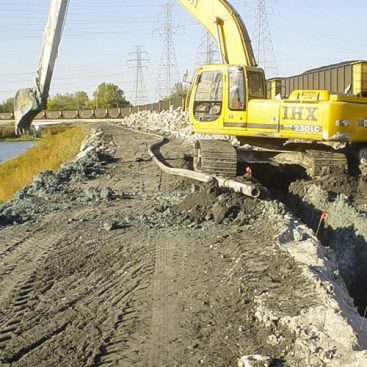 Bentonite slurry for trenching was produced on site in GSI’s custom-made batch plant and pumped to the trench. The SB wall was 12,111 feet in length. 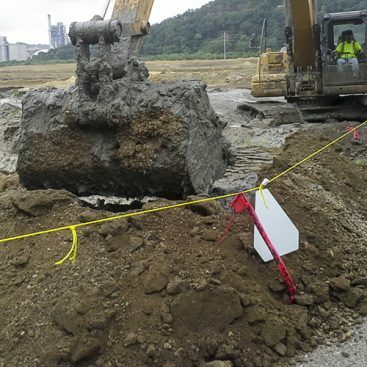 Trench spoils were blended with bentonite slurry as well as additional dry bentonite placed alongside the trench to create a controlled backfill mix. The target permeability for the SB wall was an average of 1 x 10-7 cm/s. Target permeability was attained in all samples with an overall average permeability of 1.41 x 10-8cm/s. Geo-Solutions’ commitment to safety was demonstrated on this project as it was completed with no incidents, accidents or near misses under active supervision by MSHA and the Mine’s safety department. Additionally, the Mine, including our project, was undergoing an active MSHA audit during completion. There were no MSHA findings associated with the slurry wall installation operation. Because the surface mining operations depended on the completion of our work, schedule was a major focus. 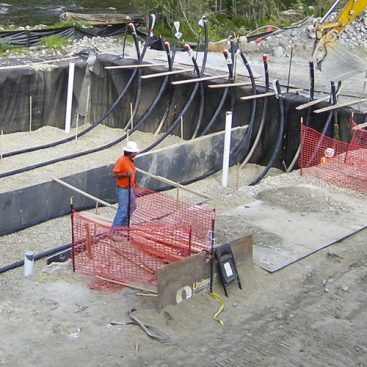 Local seasonal weather conditions caused shut downs, making the project schedule challenging, but the project was ultimately completed ahead of schedule.